X-Small - $94.99 Only 3 left! Small - $94.99 Only 5 left! Medium - $94.99 Only 4 left! Large - $94.99 Only 4 left! Boba Fett has always been one of the more intriguing characters in the Star Wars universe. That's what happens when you're the cloned adopted son of an infamous bounty hunter, people think you're pretty cool. Add to that, people are fascinated with a character whose worldview is difficult to pin down. What is Boba Fett's motivation to keep doing what he's doing? How does he feel being essentially manufactured into existence? And does he was a sense of right and wrong when it comes to his jobs, or is he simply out for himself? Oh yeah, and it doesn't hurt that he's got a totally awesome uniform too. Now, we don't like the idea of cutting the ladies out of the fun, and just because Boba is a dude doesn't mean that the women shouldn't have a chance to become the super sweet bounty hunter themselves. 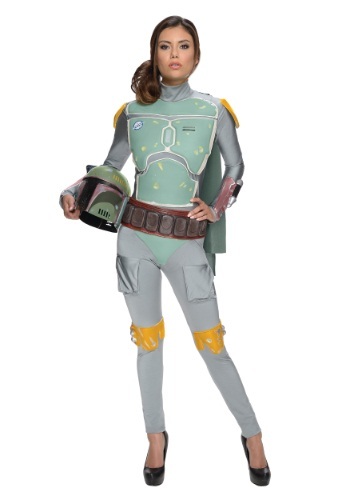 That's why we're super pumped about this Star Wars Female Boba Fett Bodysuit. If you've always said to yourself, "The Fett man is my favorite character, I just wish there was a way I could dress up like him when I hit the next comic book convention..." now there is! This officially licensed Star Wars costume is 88% polyester and 12% spandex stretch knit fabric. The jumpsuit has a back zipper, mock turtle neck, and sewn-on fabric armor pieces. The cape is sewn to the shoulders of the jumpsuit. The molded latex belt fastens with Velcro at the back of the jumpsuit. The helmet is in two pieces which fasten to each with Velcro. Just be sure to add a weapon from our accessories store to complete the costume.